Salt cod is one of things I always want to use more of in cooking since I live in an area that is heavily Portuguese and Caribbean and it’s a staple foodstuff to both cultures. Unfortunately the UK has no real relationship to it and when I moved to Brixton, the closest I’d come to it was reading Mark Kurlansky’s excellent books Salt and Cod and had never eaten it or learned how to prepare it. Bearing in mind I also still only had dial up internet in those days so couldn’t easily nip online to give myself a crash course in it like I do now with unusual foodstuffs. Which is a long winded way of explaining how and why I came to make a leek and salt fish stir fry with unsoaked salt cod the first month I lived in Brixton. And a very good reason why it’s taken me the guts of a decade to buy it again. However I wanted to do an Easter recipe with it in homage to its Southern European heritage where bacalhau is traditionally served on religious holidays. Potatoes, salt fish and olive oil beaten together to be smooth and creamy could not be wrong. And it wouldn’t have been if I had been so busy getting the gossip from my fishmonger to realise I’d only ordered the tiniest piece of salt cod that would barely feed a mouse (especially not the overstuffed gluttons currently terrorising my kitchen) and I needed a way to make it all go further. Years ago I had a salt cod scotch egg at the Lido Cafe at Brockwell Park and it was the best thing on their menu and discovering last year how easy scotch eggs are to make meant I had my answer to my shopping mishap and a way to get even more eggs into my life than usual. Start by soaking your salt fish. Mine was a fillet with the skin an bones still on and it’s almost impossible to remove these before soaking, so if you are lucky enough to get this kind of salt cod, buy a heavier piece and account for the drop in weight after soaking. Soak this style of salt cod in cold water for 24 hours, changing the water halfway through. Remove the skin and as many bones as possible, place in lots of cold water, bring to the boil and then gently simmer for about 45 minutes until the fish starts to flake apart. Drain and rinse well, removing any remaining bones with your fingers. If you can only get the little plastic packets of skinless and boneless salt cod in the Caribbean style, you can actually cut down this stage. Simply put the salt fish in a saucepan and pour boiling water over it and leave for 5 minutes. Drain and repeat. Then add boiling water for a third time and boil rapidly on a rolling boil for 15 minutes to break up the fish. Drain and rinse and allow to cool. Peel, dice and boil the potatoes until tender. Drain and mash well, beating half the olive oil and lemon juice into it until it’s as creamy as possible. Set aside to cool slightly. Blitz the salt cod lightly in a blender with the rest of the olive oil or mash it into a smooth paste with a pestle and mortar and mix it in with the mashed potato to form a smooth, almost stiff mash. You can make more than the recipe states and use it for making dishes you’d use regular mashed potato for. Allow the mix to cool. Hard boil the eggs while the bacalhau is cooling. I do this by putting the room temperature eggs into boiling water, bringing back to the boil and boiling for 1 minute. I then turn the heat off, put a lid on the pan and leave to sit for 6 minutes. I then put them into cold water to stop them cooking so the whites are set and the yolks are still soft. Once cooled, simply peel them. To make the scotch eggs, divide the bacalhau into four portion and roll into a ball and flatten it out onto the palm of your hand. Set the boiled egg on it and start to shape the mix around it so the egg is completely covered. You maybe need to do a bit of pinching and patching. Repeat with each egg and chill for 30 minutes. Put the oil in a deep saucepan and heat to about 180C according to a thermometer or when a bit of leftover mash bubbles and rises to the surface. Set out a dish with flour and season it with mustard and salt and pepper. Beat the eggs into a another dish and put the breadcrumbs in a third. Roll the covered egg in the flour and then into the beaten egg and then into the breadcrumbs. Put straight into the hot oil and fry for about 2 minutes each side. Depending on the size of your pan, you can cook two at a time before the temperature drops too much and you get a greasy egg. Drain onto kitchen roll and repeat with the other two eggs. Serve warm or cold. Mine went very well with a cold beer both straight from the fridge when I felt peckish but not really hungry enough for a meal. The salt cod goes really well with egg and despite not being that hungry, I managed to inhale two of them in a row. Well worth all the various steps! 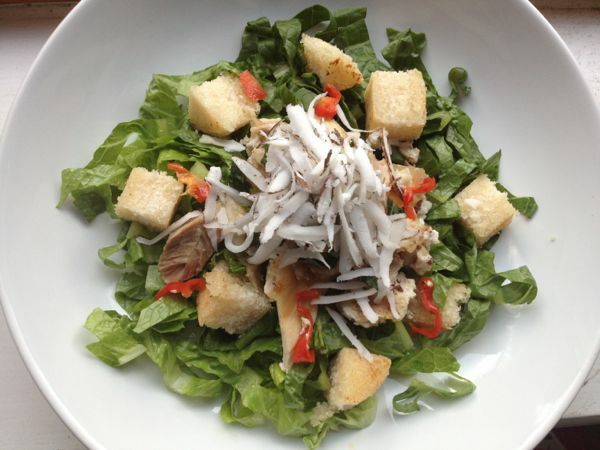 When the weather warms up, salad becomes your new best friend. Quick and easy, it can be a great way to try out new things or reinvent old favourites. A recent trip to the Nour Cash and Carry saw me impulse purchase a coconut and a packet of bammy. This traditional Jamaican delicacy is made from ground cassava. It was the staple carbohydrate before the Second World War when wheat based breads became cheaper and easier to bake commercially. Wheat and gluten free, it is soaked before being fried or toasted and I just knew it would make great croutons for the salad. Barley water is just that. It’s the water in which pearl barley has been cooked, strained off and flavoured with something sharp or citrussy to refresh on humid summer days. Reputed to be as excellent for one’s system as cranberry juice, it’s a healthy and cheap thing to make from scratch. I’ve flavoured mine with hibiscus or as it’s known in Jamaica, sorrel for a scarlet twist on the more classic lemon version. It also means you have delicious nutty barley cooked and ready to eat. I’ve made a fresh salad, stuffed full of grilled courgette, scallion and fennel, studded with emerald green broad beans and salty capers before being dressed with mint and olive oil. Make a big batch and keep it in the fridge for a tasty lunch or dinner when you can’t leave Centre Court for long. It’s fabulous as it is or with cold chicken or grilled halloumi on the side. I love spinach. Gorgeous green leafiness, it seems to suit every single style of cooking you can challenge it with and adds iron rich taste to everything. But even Popeye would baulk at the price of it these days. Pillowy packets of it disappear into nothing when cooked and takes you aback everytime. When I first lived in London on a student budget I ate mountains of the frozen version and it still seems to taste of the cheap white wine I washed it down with making me struggle with this budget option. 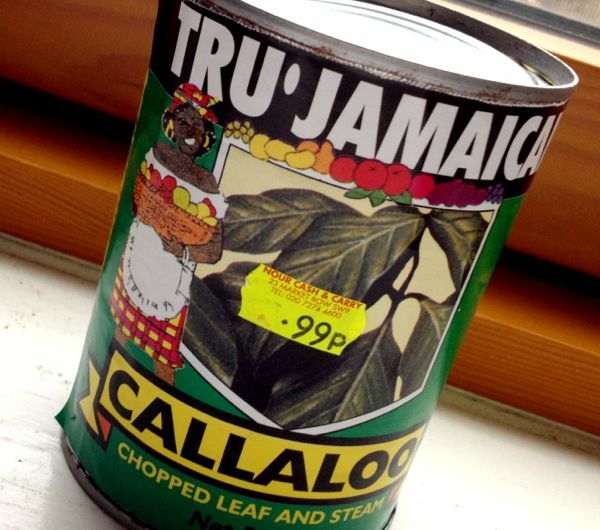 So imagine my joy when I came across a huge can of that altogether most robust cousin of spinach, callaloo, in the Nour Cash and Carry for just 99p recently. The stronger stems and bigger leaves suit canning well and it retains its texture and flavour much better than spinach does. I thought it would suit slow cooking well and decided to update the Indian classic saag aloo with callaloo for an easy one pot meal.